Lovely old typewriter BUT they are very unforgiving. If you make the tiniest mistake, there’s no ‘Backspace’ key and if you get a paragraph out of context, you can’t cut and paste it somewhere else. Just look at it – don’t try to work on it! I learnt to type in school and if we made a mistake we had to start again… I hated it (too many quick, brown foxes!). PJ – I bought a vintage typewriter a few years back. It needed the new ribbon AND a good cleaning which I had done by a typewriter shop (can you imagine them still being around). I, too, have an attraction to vintage items. Often these things are better made (for sure, they were not made in China back then) and they are NOT plastic. Respect for the past, as you mentioned, is part of it. Thanks for this post. There are a lot of shops that no longer exist… technology has moved the world on so much but many things have been left behind. Vintage items are fascinating and there seems to be a renewed interest which is good. I’d love to rehome one of those old typewriters! I got plenty of space for at least one, maybe a pair of siblings 🙂 Not sure if I would write that much on them though, I am terrible at writing typos, what would I do without my Ctrl – Z, Ctrl – C, and Ctrl – V ?? 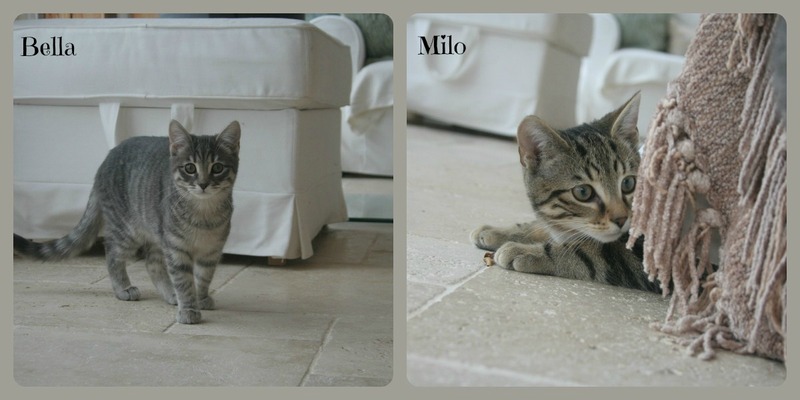 Oh, and your kittens are so cute! 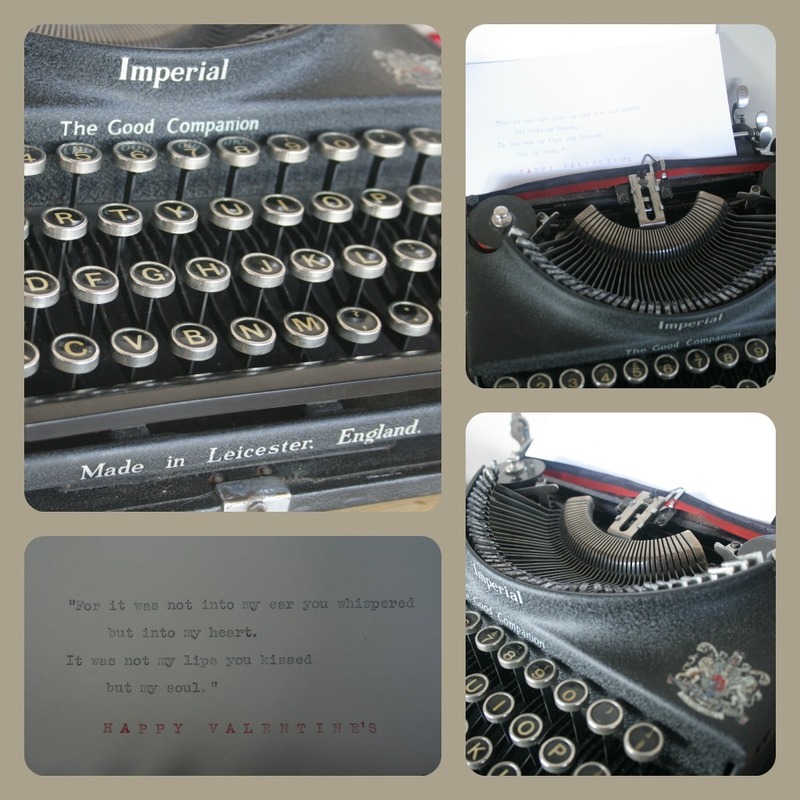 The beauty with rehoming these is you don’t have to use them… other people will love them so much that they will be drawn to the typewriter and instantly plonk away (rather like having a piano in the corner). Each generation has it so much easier… and so much harder too! We have so many labour saving devices (washing machines, dishwashers etc) but so little time. These things have revolutionised house work to the point of making us busy doing other things. I think vintage items help to bring history alive so it’s wonderful that children are involved. Hurray for that. We are expecting rain by Tuesday, but today it’s incredibly warm and clear. A little taste of things to come. She’s a beauty. I’m sure for your garden birds but thanks for the Cranberry Valentine, so cute and your lovely little quote was sublime. I laughed when you mentioned the smell of vintage treasure. I thought I was they only one who noticed that. I also adopted a homeless vintage typewriter, which is of course Aqua. It is pretty low maintenance and never needs a walk, HA (you’re so funny). It sits on my desk and I just adore it. Mines from the 70’s though, kind of mod and more kitschy than beautiful. I finally found someone with old ribbons and bought three. What I had to do was put the new ribbon on the old spools. The typewriters from the 60’s and 70’s are equally as charming… and of course you have an aqua one!! I can imagine that you love the whole kitsch vibe… it would suit your personality and favourite colours perfectly. These old things keep me grounded somehow. They also remind me that they’ll be around a lot longer than me so make the most of life. I am so sad when I see that jewellery – the definition of upcycling is that you make something better than the original item and that just isn’t always the case with people who are trying to cash in on the current trend. I make it clear that when I cut up books to make jewellery they are the most ragged, drawn in, broken down books imaginable and are definitely more useful as earrings! To me, if a book is in good condition it has greater value AS a book than as jewellery. I am in love with vintage sewing machines and they too have ‘that’ smell. And the simple, rugged construction means they will go on forever. And the shapes are so gorgeous! Ah yes, Bagpuss. I used to work for someone who was nicknamed that (not to his face!) because he was always nodding off in meetings!! 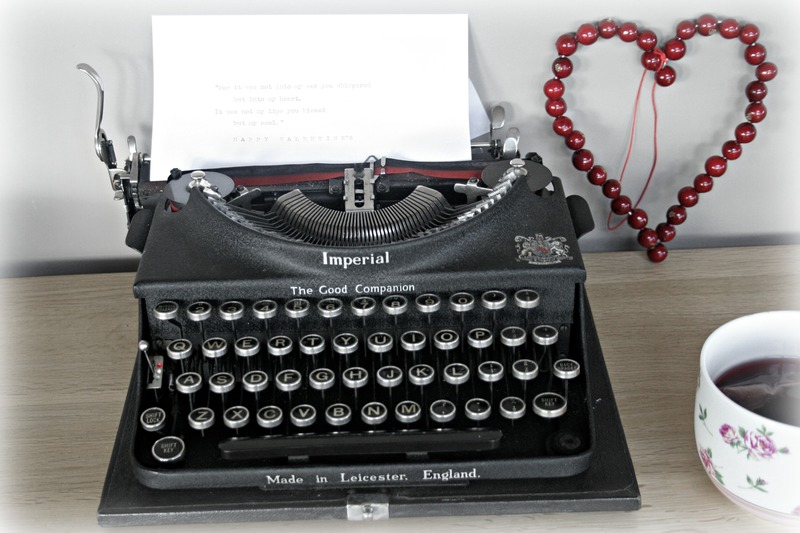 And I love the typewriter, I can almost smell it too as I learnt to type when I was about 12 on a ‘manual’, I seem to think it was even before Tipex was invented because I had a pencil shaped eraser with a brush on one end for rubbing out mistakes!! I just got the same Imperial typewriter like yours yesterday. My friend brought back from London for me and I totally love mine. Altogether I have rescued 12 typewriters and sold 1 of the typewriter to a friend.